Over the past three years, IDC, Gartner and Strategy Analytics have generated data on the global tablet market which specifically conveys the idea that Apple's iPad business has been dropping into minority market share while Samsung and other Android tablet makers have been shipping astronomical millions of units. Samsung's internal documents indicate that the company's own public representation of its competitive position in the tablet market was not true, and that the company appears to have intentionally misled its own investors and the analysts covering its business with false statements about the health of its tablet sales. A slide (above), from Samsung's June 2011 chief executive presentation on the 2012 market, presented the company's understanding of the tablet market as increasing from 10.4 million in 2010 to 28.3 million in 2011 and estimated 41.2 million in tablet sales for 2012. But of the Total Addressable Market, Samsung portrayed all Android devices as being a minority in the tablet market dominated by Apple's iOS iPad. 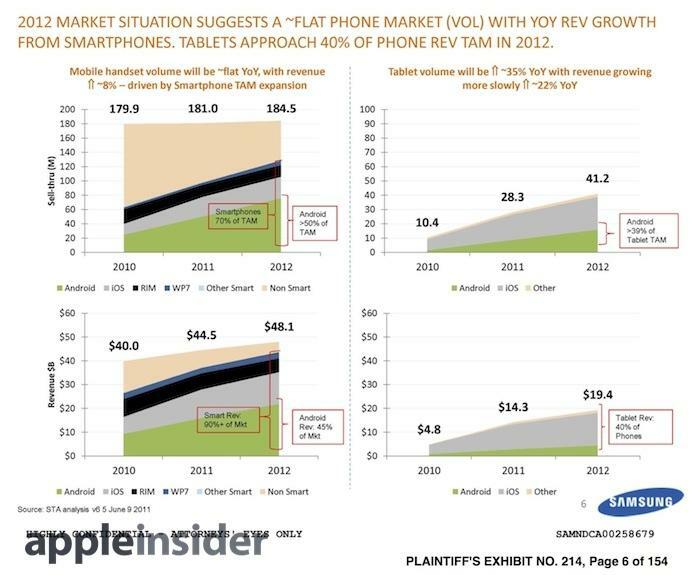 For 2012, Samsung's data estimated that Android would make up 39 percent of the tablet TAM. In terms of dollar revenue, Apple's iPad market share was even higher, reflecting real world results in the form of profits earned. A second "top secret" Samsung document from February 2012 (below) detailed the "strong competition from both the high end iPad and low tiered [Amazon Kindle} Fire/[B&N] Nook" in the U.S. market. In tablet units, Samsung spelled out Galaxy Tab quarterly sales in the low hundreds of thousands, adding up to total 2011 U.S. Tab sales of around 1 million. Samsung contrasted Apple's 2011 U.S. sales of 17.4 million iPads, Kindle Fire sales of 5 million units, and 1.5 million Nook sales. That means Samsung itself knew it was selling fewer Galaxy Tabs than even the low end Nook, an embarrassing fourth place sales position one wouldn't expect from the world's leading electronics company with top volume sales in other mobile devices. Samsung's tablet sales were behind the entry level attempts of a couple of bookstores to bang out a tablet device they could sell as a way to develop a market for ebooks. And Samsung not only had a year head start over them in building Android tablets, but also had a decades long legacy of building Windows tablets and all kinds of other hardware. Samsung wasn't just unable to make a tablet device that consumers wanted to buy; it was actually asleep at the wheel, failing to fully respond to the iPad in part because its leadership didn't even anticipate how quickly the market for iPads was increasing. In terms of revenue, Samsung was also well aware that Apple's iPad was eating everyone's lunch, collecting over $10 billion in iPad U.S. revenues that year while Samsung earned less than $560 million on its own tablet sales, nearly half as much as Amazon brought in (and then lost) during just during the winter quarter alone. 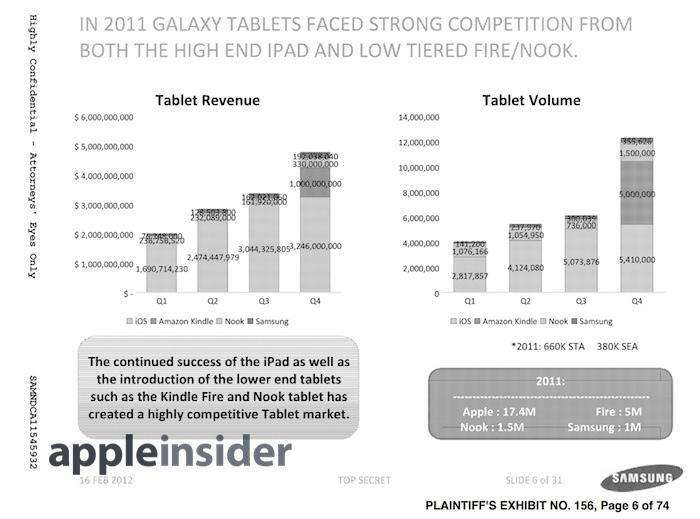 Even the low priced Nook was beating Samsung in both tablet unit sales and in revenues. Samsung's "quite smooth" tablet data spread by "researchers"
In early 2011, IDC's Loren Loverde made headlines by contradicting Steve Jobs' contention that iPad had claimed 90 percent of the tablet market in its first year. Instead, IDC insisted that Samsung by itself had taken a 17 percent share of the tablet market in the final quarter of 2010, based on Samsung's announcement that it had shipped 2 million Galaxy Tabs. Neil Mawston, a director at Strategy Analytics, also repeated Samsung's 2 million figure for winter quarter 2010 tablet shipments, announcing that "the Samsung Galaxy Tab was the main driver of Android success," because it made up 2 million of the 2.1 million tablets that were said to have shipped with Android. Virtually all of them! Strategy Analytics also assigned Samsung a 22 percent share of the entire tablet market, somehow reaching a different number than IDC even though both were working with just two significant numbers: Apple's officially reported iPad sales and Samsung's double-speak mumbling of an evasive answer given to analysts during an earnings call. However, as the Wall Street Journal later reported, Samsung's "2 million" number for 2010 was merely shipments of initial inventory sell-in designed to fill the channel, not actual sales to actual buyers, a concept that has a casual nexus with the idea of a "market" one could have "share" in. That 2 million figure was presented during Samsung's quarterly earnings call with investors, making the "quite smooth" slip not just misinformation for blogs to repeat, but a deception of the company's investors that led them to think that Samsung was enjoying strong tablet sales when it wasn't. In fact, over the next year Samsung's entire U.S. tablet sales were on par with other major flops such as Microsoft's Zune and Surface, or Google's Honeycomb tablets, Google TV or Chromebook Pixel. And as Samsung itself depicted in the above chart, it knew internally that in 2010, the full range of iPad competitors were barely a blip, rather than Samsung alone having the 17 to 22 percent share market researchers had advertised. Previous Samsung tablet sales documents (above) which leaked during the first trial in 2012 harmonize with the U.S. numbers Samsung presented in the documents above: across all of 2011, Samsung sold just under 1 million tablets in the U.S.
None of the major market research firms appear to have issued U.S. market share data for tablet sales since the iPad was released, preferring to instead publish global market figures that incorporate vast numbers of "white box" devices built by unnamed "other" companies in unspecified markets. This is a marked departure from their PC industry reports, which detail both U.S. and global sales. However, as noted by Apple's chief executive Tim Cook, there is no evidence among web usage stats or app sales that support the idea that vast numbers of unbranded tablets are eclipsing the iPad globally. Instead, iPad shows up in web logs as making up an astounding 84 percent of all tablet traffic. 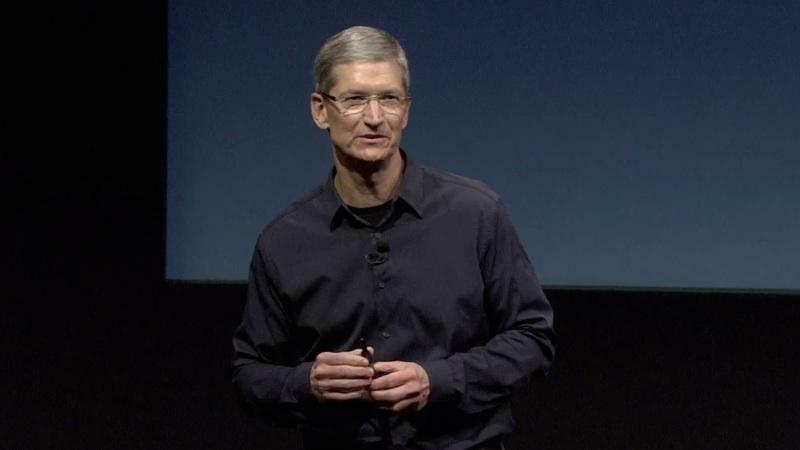 "If there are lots of other tablets selling," Cook said on the subject, "I don't know what they're being used for. 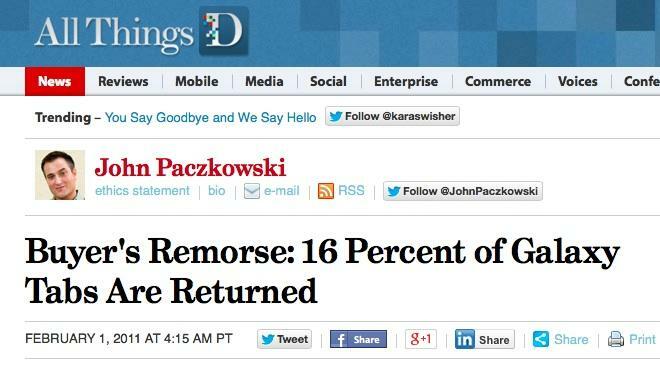 Because that's a pretty basic function: web browsing." Instead, there is strong evidence supporting the idea that Apple's iOS continues to dominate as a mobile device platform, including Microsoft's decision to release Office as an exclusive title for the iPad first. It also calls into question why IDC, Gartner and Strategy Analytics seem to carefully avoid mention of U.S. market share figures that would provide valuable insight into the domestic market for mobile apps and accessories and illuminate the threat iPads might pose to conventional PCs. It certainly appears that these market researchers, just like every Android tablet manufacturer, doesn't want to talk about specifics because the facts have nothing good to say about the Android or Windows platforms that indirectly pay the bills of said market research groups.